So take this page as your guide to what you need to know when buying kilts. The first thing to make clear is that you cannot walk into a quality kilt maker's shop, and walk out with a kilt the same day, that goes for their websites also. Because a genuine authentic Scottish or Irish kilt is a bespoke made to measure garment, and most kilt makers will quote you six to eight weeks for delivery. Below you can see a photo taken at Cairngorm Scottish Imports, Toronto, Canada. 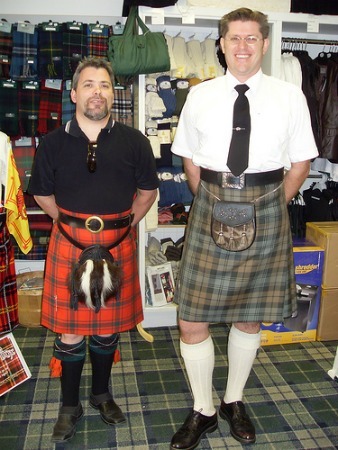 The photo above shows a staff member, on the right, and a customer, both wearing genuine traditional Scottish kilts made from 16 oz worsted wool. There are countless so called kilt makers springing up on our high streets, and on the internet, offering what they would have you believe are genuine Scottish kilts, at unbelievably low prices. Take it from me, they are not. They are in fact very poor imitations of kilts, mostly made in China and Pakistan, and unless you want to walk around in a poor quality tartan skirt, don't be lured in by the low price. If you really want to know about cheap kilts, which are the genuine article, then read that page. 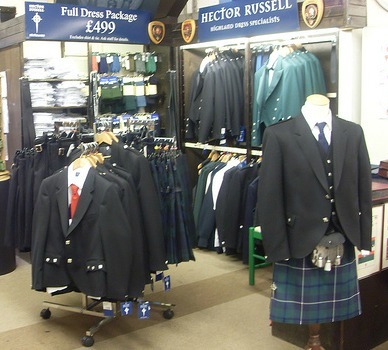 Below you can see a photo of the kilt stall at the Jedbourgh woolen mill, showing heavyweight eight yard kilts, made by one of Scotland's premier kilt makers. Nowadays there are many websites offering kilts for sale, and indeed many of them do offer quality merchandize. In fact there is one American website to which I send many of my visitors, who are interested in buying kilts. They are America's leading Scottish Irish merchant and supply the American market with top quality Highland Dress, and Irish kilts, they also offer a wide range of top quality Scottish and Irish products. Many visitors to this website, especially some of my American ones, are very interested in buying a Welsh kilt, and with that in mind I wrote a page about a Welsh company, who specialize in Welsh kilts and their accessories. So for those of you interested in buying a kilt please inform yourself properly as to what constitutes an authentic Scottish kilt. It should be eight yards of Scottish made 16oz worsted wool, hand sewn, and by that I mean every stitch should be sewn by hand. It will last a lifetime and beyond, never go out of fashion, and may well become a family heirloom. So if you or any of your friends are planning to buy kilts, you now have a better idea of what to look for. But if you would like any further information perhaps about where best to buy kilts in your area, or any other aspect of kilts and their accessories, please drop me a line using the contact us page, and I will be delighted to help.